I'm a native New Yorker who grew up in the projects. My family was lower income and money was tight. So, as soon as I could – at the tender age of 12 –I got my first job in the Summer Youth Employment program. As I got older, my jobs got better and I progressed from minimum wage hourly jobs to a salary. As I earned more, I always made sure to diligently pay my bills on time. This led to me receiving – and accepting – multiple credit card offers. And since my good credit made me eligible for more credit, I ended up with a bunch of retail store cards eagerly extended to me every time I shopped. Feeling “rich” with all the credit available on my various cards, I decided to "show” my friends how much I appreciated them one Christmas. I spent thousands on overly generous and expensive gifts one year. All on credit. Ka-ching. Although I never spent over limit, and was never late paying my cards, it VERY quickly got to the point where I could only afford to pay the minimum each month. My finances finally got so tight that I took out a “payday” loan (now illegal in NY). It didn’t take long for me to realize how impossible it was going to be to pay it back. The interest rate was out of this world! I tried paying back everything I originally borrowed with my next paycheck, but couldn’t cover the extra interest too. If not for the goodness of a friend lending me money to pay off the entire loan - while letting me pay them back over time (with no interest) - I would’ve sunken even further into debt. After paying off the payday fiasco, I still faced my never-ending credit card payments. Which NEVER seemed to go down. I owed thousands. To this day, I have continued practicing the successful habits that helped me get rid of the debt. I’ve learned how to use credit to my advantage, as well as how to effectively manage my money in other important areas. As I gained new knowledge, I noticed how energized I felt learning about finances. I was genuinely passionate about personal finance. I realized that I wanted to work one-on-one helping others master the skills they needed to achieve financial security. I wanted to help my clients take charge of their financial futures. And I’ve done just that – many times over. I’ve advised thousands in the areas of employment benefits, health insurance, and other financial matters. And I’ve coached over a hundred clients in personal finance helping them get rid of debt, save money, and positively pursue their financial dreams. Now I’m here, ready to inform, inspire and empower YOU on your financial journey towards taking charge of your financial destiny. To get started “owning” your finances right away, click the link to grab my FREE tips: “10 Tips to OWN Your Money Right Now." In addition to my passion for teaching personal finance, I love watching comedies, dramas and action movies and spending time with my husband and family. A music lover since childhood, I spend every other free moment listening to R&B and Hip Hop music or creating and recording music as a Soul singer. I live in New Jersey with my loving husband. My knowledge of Personal Finance has been acquired through years of professional training, hands-on client experience, and self-learning spurred by my eternal thirst and passion for understanding money and how to make it work for me. I am a Financial Coach/Counselor certified per NYC's Consumer Affairs Office of Financial Empowerment standards, qualifying me to work with NYC clients at Financial Empowerment (OFE) locations. In 2017 I completed over 100 counseling sessions with clients as a Financial Counselor at Bed Stuy Restoration Corporation’s OFE center. I worked on-site at Bed Stuy Restoration and off-site at the Brooklyn Public Library servicing clients. Below are pics of me ready and eager to assist clients when I worked out of the Brooklyn Central Library. I have advised clients in the financial services industry for more than 20 years at companies like Bedford Stuyvesant Restoration Corporation, Oscar Insurance, Xerox, Talent Partners, H&R Block and Chase Mellon Shareholder Services. My roles as Financial Counselor, HR Support, Client Advisor, Payroll Processor and Budget Manager have honed my skill in assessing the needs of clients and finding a solution that works best for an individual or group based on their particular circumstances. 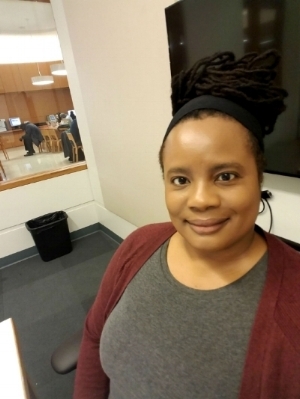 Each semester since 2012, I have been rehired as a non-teaching Adjunct Instructor (formerly College Assistant) at CUNY’s School of Professional Studies (SPS). I coach and guide new students online at CUNY SPS by supporting them in the simultaneous dual roles of Orientation Facilitator and Orientation Night & Weekend Cooordinator. I LOVE teaching financial literacy and have conducted many Personal Finance workshops with elementary, middle and high school students as a Junior Achievement volunteer. I've also created my own customized workshops on finance and leadership which I’ve presented to working adults and high school students. I am a life-long earner and a couple of years ago as a college student I participated in my college’s program designed to help us better understand policy making at the state level. So after several weeks of preparation, we traveled to the NY State Capitol to "argue" and "vote" on a bill presented on the senate floor. Our roles were to present individual arguments formulated from the point of view of what an actual Senator might deliver. My seat was that of District 6 - one held by a Republican senator at the time - so I delivered my argument on public campaign funding as a ‘Republican.’ It was a great experience! I'm also an independent R&B Singer, Song Writer & Recording Artist. Seriously. What an interesting mix, hugh? I LOVE both music and finances, so I do both. 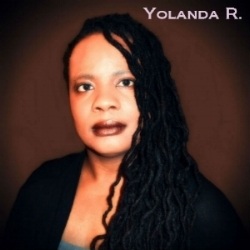 Feel free to check me out and have a listen at my website "Yolanda's Voice" or check me out and follow me on Facebook at Yolanda R.